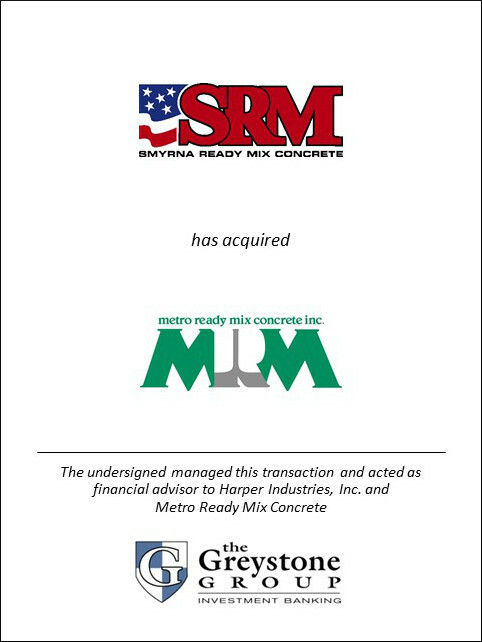 SAN DIEGO (August 5, 2014) – The Greystone Group announced today that it served as exclusive financial advisor to Harper Industries, Inc. in the sale of its subsidiary, Metro Ready Mix Concrete to Smyrna Ready Mix Concrete. Metro Ready Mix is the 3rd transaction managed by Greystone for Harper in the past 5 years. “It has been a privilege to work with Harper Industries over the past several years. We are grateful that Billy Harper continues to trust us to provide sound financial advice as he divests key divisions of his large industrial business” said Tim Oitzman, President of Greystone. Greystone previously advised Harper on the sale of Frontier Materials Concrete, the largest independent ready mix producer in Houston, Texas as well as the acquisition of CALX Resources’ Chaudet Creek Quarry in western Kentucky. Jeff Hollingshead, General Manager and CEO of Smyrna Ready Mix, stated “by joining the strengths and resources of both companies, Smyrna Ready Mix Concrete will be an even more valuable business partner to our clients. Mike Hollingshead, president of Smyrna Ready Mix, said “we are very happy to be able to retain all the Metro Ready Mix employees and gladly invite them to join our Smyrna Ready Mix family. Metro Ready Mix Concrete, LLC, headquartered in Nashville, Tennessee, operates 14 ready mix plants in the Greater Nashville relevant market. As the largest ready mix producer in the Nashville market, Metro generated approximately $33 million in revenue on the production and delivery of nearly 350,000 cubic yards of concrete annually. Harper Industries, Inc. is a large construction and materials company based in Paducah, Kentucky. Subsidiaries and affiliated companies include Federal Materials Company, the largest ready mix producer in western Kentucky; Morsey Constructors, the preeminent leader in the central and southeastern United States construction services industry; Precision Steel, a full service steel fabrication company; and CALX Resources, a limestone aggregate producer with a quarry in Grand Rivers, Kentucky. Smyrna Ready Mix Concrete, LLC is the largest independent ready mix producer in Middle Tennessee, operating 30 locations in Tennessee and Kentucky. With the acquisition of Metro, Smyrna will operate 200 mixer trucks, four concrete pump trucks and a construction materials division operated by 300 employees.